I love to eat in Dhaba and whenever I go to my mom's place, we all go to the Dhaba place in cenetoph road in chennai which is our favorite restaurant. I always like to eat punjabi dishes and especially their sides dishes like this green peas masala, dhum aloo, etc are my all time favorites. 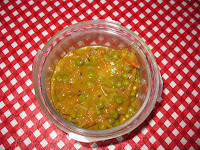 I got the recipe for this green peas masala from a weekly magazine, written by a punjabi lady living in chennai. I took the print out of the recipe and tried yesterday. It came out really well. One of my friend (who is from Dehradun) visited us yesterday, and she tasted it and said its really good... Here goes the recipe. Adding cream will definitely make it rich..Looks yummy..Even I like punjabi dishes..
Peas Masala looks lovely.It is my fav. Nice pic vidhya. 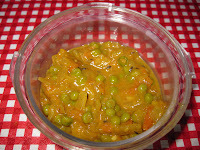 Peas masala looks delicious & rich. Will try soon. g8 dish looks easy to cook do we got to add dhaniya powder? Gr8 Explanation. I followed in the same way and achieved wonderful result !!! I tried your recipe with 2% milk in place of coconut milk. It came out good. Thanks.